Multigas Distribution System | Giacomini S.p.A.
Multigas is the result of our lengthy experience in the production of articles for the chased distribution of fuel gas in the domestic environment. This system takes full advantage of the peculiarities of multilayer pipes - the unquestionable stars of the system range in recent years. Apart from pipes in various diameters, the system also includes a vast assortment of multipress fittings as well as other specific components for gas distribution. And all with optimum manufacturing quality, easy installation and operating reliability. Metal-plastic pipes ideal for transporting gas for domestic use. Available in all the most commonly requested diameters, and with a corrugated protection sleeve. A complete range of pressure fittings for creating multilayer distribution lines easily and safely. Possibility of pressing with various profiles. The Multigas system is completed with other components and accessories, like the flush-mounting shut-off valve and the terminal fitting-holder box. Multilayer pipes available in coils, in the most commonly requested diameters. There are two versions - bare, or with a corrugated protection sleeve (anti-crushing, self-extinguishing and anti-UV). The Multigas system carries the KQ UNI/TS 11344 certificate for multilayer metal-plastic pipe systems and fittings for internal installation for gas transportation. The suitability of the pipes and fittings for transporting gas is immediately identified by their yellow colour. On the bushes of the fittings there is a yellow label with the words “RM GAS Series KQ UNI/TS 11344”. 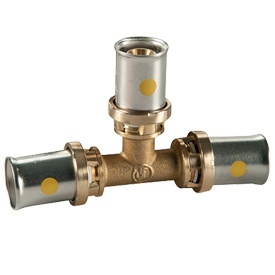 Brass fittings of the RM GAS multitong series. These can be pressed with TH pressing profiles (Giacomini standard), or H or U.
insulating barrier to avoid corrosive electrochemical phenomena in the contact between the aluminium of the pipe and the brass of the fitting. 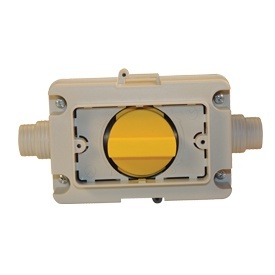 To install the flanged fittings for connection to the users, there is a compact fitting-holder box. It holds the pipe and corrugated sleeve in place, protecting the pipe and fitting and also enabling the connection to be inspected in the future (as required by the installation regulations).